​​​​​​​​​​​​​Carolina Labradoodles is a small, family-owned breeder in North Carolina of exceptional Multigenerational Australian Labradoodles. We believe Australian Labradoodles make the best pets and we have the proof! You can follow us on Instagram for more candid pics of our dogs or on our Facebook page for updates! ​​Carolina Labradoodles are genuine ​​​​Multigenerational Australian Labradoodles, which means you can expect a consistent non-shedding dog with a beautiful "teddy-bear" look. We are located in Monroe, just minutes from Charlotte, NC! ​ Carolina Labradoodles is a small, family-owned breeder in North Carolina of exceptional Multigenerational Australian Labradoodles. We breed for non-shedding, allergy friendly, trainable, loving and affectionate family pets. 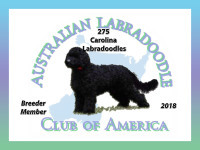 We are proud to be breeder members of both the ALAA (Australian Labradoodle Association of America), and the ALCA (Australian Labradoodle Club of America).